BlogForce9: VisualStrap - Exploring Possibilities! Few days ago I introduced a set of components called "VisualStrap" which will bring the BootStrap to VisualForce pages very easily. VisualStrap is still work in progress , I am adding new components and improving it whenever I get time. Till now, I was able to document about most of the components but the documentation needs much more than just description rather may be some examples, showing the capability of the package. Here are some very first examples. A simple highlight bar style page that gives a quick glance of the Case. This page demonstrates the use of some common VisualStrap components and how VisualStrap grid works. This page is a simple dashboard that gives user about the daily information that they need. Like pending activities for the day, assigned cases, assigned leads, last viewed Accounts/contacts. VisualStrap is not limited to just these two pages, it can be leveraged to do much more. People out there can extend this to do much more ! Visualstrap is available as Managed package and as well as github. You can grab the same from the project detail page. To make the above examples work you have to install VisualStrap from project page below. "vs" is namespace prefix from the managed package, if you are using the source from github you may have to replace "vs:" with just "c:". Were you able to figure out how to implement the controller ? You can also find the code in the Github link from the project detail. while using vs:importvisualstrap in VF page,it is showing me error, Error: Unknown component vs:importvisualstrap.Though I have the package. 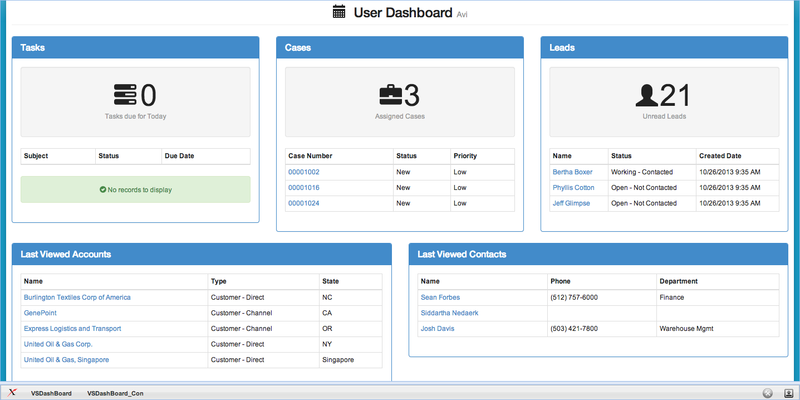 Hi Avinava, we tried adding the 'Case Overview Page' to our case detail page layout. The page loads nicely when we initially open a case record. However, once the page comes up, it looks like it continues to make requests to the visualforce server,displaying 'waiting for the server' messages. The page continues to hang up until finally the user can no longer do anything on the record detail, even refresh the page in the browser window. We tried using a custom object in place of the case object and we tried using both the managed and unmanaged packages. Do you know what maybe causing this issue and how it can be corrected? I'm having the same issue as Brett. The user can click on the edit record but they can no longer double click on any field to get it edited. Any advice?